I'm a little late on the bandwagon regarding this product, but it's better late than never right? I recently picked up two of the the Bourjois trio eyeshadow palettes in Mordore Chic and Gris Lilac from the clearance section at Tesco for £2 each. If you saw my monthly haul you'll of seen that I thought these were slightly over-priced at £7.99 each. 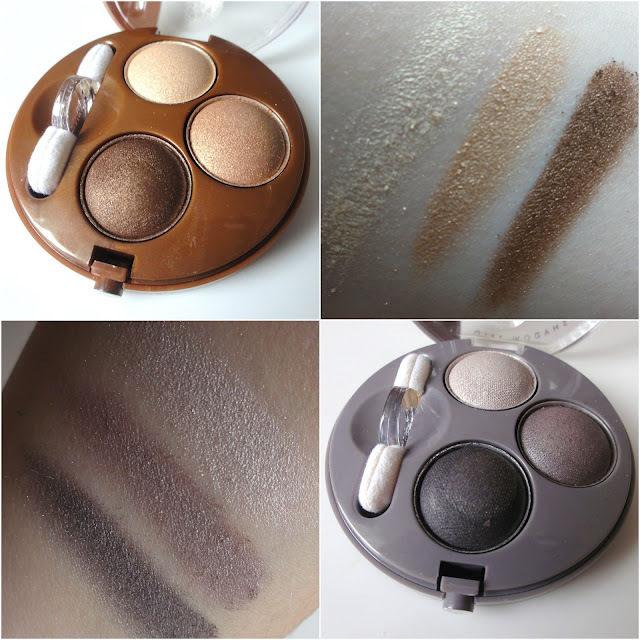 I am a fan of the brand but I wouldn't pay £7.99 for 3 eye-shadows from an high-street brand, especially when I can get 12 shades for £4 from some of the top budget brands on the high-street and they do a really good job. They were so many of the Bourjois palettes in different shades that I sort of wish I'd of picked more up. Despite having a negative opinion on the full-price tag I can't express how much I love these. They've barely left my makeup bag since I picked these up and I've been mixing between the two everyday. Mordore Chic is my favourite out of the two. I've reached for this so much and created a gorgeous, subtle smokey eye in neutral and golden tones. I love creating this look for day time wear and find it to be very versatile with the rest of my makeup look. I've used Gris Lilac a couple of times during the day but I find it sways more towards a evening/night look. I have, however, been mixing it up and using both palettes at the same time to create something even more different. The pigmentation is great, the lasting power is awesome, and despite using no primer I found by the end of the day I'd experienced no creasing - even with high heat. Despite these having a seal of approval and coming highly recommend from myself, I still wouldn't pay the £7.99 price tag. I'm currently away so please bare with me replying to your comments. For a more prompt response please contact me via Twitter at @ABritishSparkle and I'll get back to you asap. I love the look of the brown ones. I love these trio eyeshadow palettes from Bourjois! The shades you've picked out here look gorgeous and I love the Mordore Chic one especially! Also can't believe that you only got these for £2!